Remove Unwanted Graffiti From Your Property. Keep your property clean. Leading business in Ontario choose Sugrim’s graffiti removal service to keep their business premises free of graffiti. Sugrim Maintenance offers graffiti removal services. We use clean and green anti-graffiti solutions that are cost-effective and environmentally sustainable. Once the unwanted graffiti has been removed from your property, we do follow-ups to rectify and cover the graffiti damaged surface. Our field crews are determined to get original background. Choose Sugrim’s graffiti removal service to keep your business premises free of graffiti while advocating environmentally friendly approach. 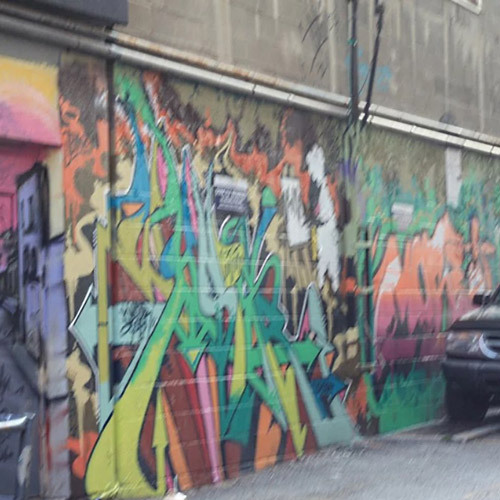 As we have seen increase in the graffiti related incidence in the metro Toronto, and surrounding areas, we have assigned some of our staff just for graffiti removal services. We are committed to maintaining a strong client base by ensuring that all properties in our care are clean and left in excellent condition. High Temperature pressure washing may be applied to remove graffiti from surface. Pressure washing may be used in combination with other methods and products. We use less abrasive and environmentally friendly methods. Bricks on the wall and concrete surfaces can be cleaned with a environmentally sustainable product. Good on bare brick, paint, metal or glazed surfaces for relatively any amount of graffiti. An on-site computerized color matching approach enables us to color match your existing paint color and mix the close match to original color for any wall that needs to be painted. Painting is perhaps the most common way to fix graffiti problem. Made from wax polymers, this compound is an amazing anti–graffiti coating material which is virtually invisible. The coating flexes with ambient temperature, is durable and UV stable. It can be applied to almost any exterior surface and will protect against worst graffiti.